How the time has flown. This time, last year, I was just clicking the ‘upload’ button on Holy Island. Little did I know what fate had in store for that bit of fiction, because by May 2015 it was number 1 in the Amazon UK bestsellers chart and at the time of writing this blog post, it is back up there at number 6. Absolutely mind-boggling. I have said it many times before, but I will keep on saying it: thank you to all of you who read it and took a chance on LJ Ross. Back in September, its sequel Sycamore Gap was published as an e-book and that made the top 20 not long afterwards (and currently it’s back in the top 20 – woo hoo!). 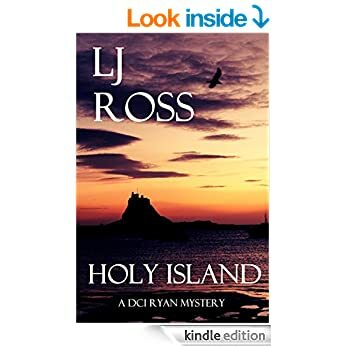 Now, Holy Island is out as an audiobook and Sycamore Gap will be following very shortly (it’s on pre-order at the moment, for those who are interested). All of this has made for a really remarkable year and I hardly know what to expect for the year to come. What will 2016 hold? There are few certainties in life, but I know one thing for sure: I love my job and will continue to write until my hands are too arthritic to type. Even then, I’ll learn to dictate before I stop having fun telling stories. There is no right answer which fits all. Life is an endless cycle of ups and downs and you have to assess what is right for you and any dependants at a given time. You have to be honest about yourself and what you would like to achieve; you have to work hard and put everything you have into it. But, most of all, you must be unafraid of change. This seems a simple thing, but it really isn’t. Many people are terrified of change and frankly there’s nothing wrong with that. It’s nice to feel settled and content. It’s a question of what you are prepared to settle for in life and if you are happy enough, then crack on! All of that said, if you do decide to ‘give it a go’, platforms like Amazon KDP are perfect. There, you can dabble in publishing your own work without necessarily giving up the day job. If you really want to push your work, you might need to devote a lot of free time to marketing and editing, not to mention the writing, but so long as you don’t mind doing both at the same time then it’s a fail-safe option with very little personal risk. Like me, you might be flabbergasted to find that people enjoy your writing and would love to see more of it. Before you know it, you’ve got a website, a blog, various social media accounts and a full-time profession! Whichever way life takes you, I hope that all of you reading this have a wonderful 2016 and that it brings you everything you hope for. Many congratulations, Louise, on a hugely successful year. Really encouraging stuff. All the best for 2016. Read your first two books, Louise. Couldn’t put them down. Fantastic twists and turns. Well done, I am now eagerly awaiting the third one. Thank you, Tony! I’m so pleased to hear that you’re enjoying the series so far!